When it’s your first time visiting an area of the country, we know that it can be difficult to know where to go, where to eat, drink, swim. It can often leave you torn, confused and worried you won’t be able to make the most of your stay. Well, we’re here to help. Every month for the next 6 months, we’ll be sharing with you one of our favourite days’ out in West Wales, with a few insider local tips on the best spots that we’ve found over the last 20 years – including secret beaches, hidden gems, the best local coffee stops, places to eat and lesser-known beauty spots that you might not otherwise find in the guidebooks! The second in our series takes us up the beautiful Tywi valley towards Llandeilo, through the heart of rural Carmarthenshire – a lovely, leisurely day for lovers of plants, the natural world, beautiful scenery and beautiful brunch! Head out to Carmarthen, and then follow the B4300 towards Llanarthne. The first stop has to be the world-renowned National Botanic Garden of Wales. A fascinating blend of the modern and historic, you’ll find an inspiring range of themed gardens, the world’s largest single-span glasshouse, a tropical Butterfly House, food growing projects, play areas and a national nature reserve in the extensive grounds. You could easily spend a whole day here! By now, you’ll probably be getting hungry! Not much further down the B4300, you’ll arrive at Wright’s Independent Food Emporium, the passion project of chef Simon Wright. They champion local produce, serve beautiful fresh dishes and sell produce, crafts and cookery books from their large restaurant in the middle of the Carmarthenshire countryside. Need a brisk walk after your brunch/lunch? 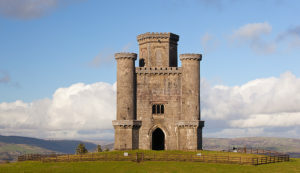 Take the short hike up to the 36 feet high Paxton’s Tower, built by Sir William Paxton in the early 19th century in honour of Lord Nelson. 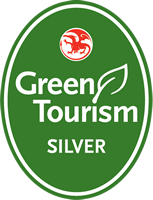 You’ll probably have spotted it from the Botanic Gardens, and the view from the top over the Towy valley is spectacular. 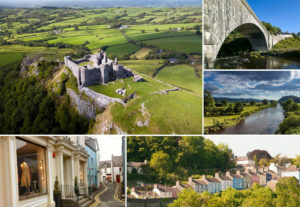 Next, head on to Llandeilo, one of the most attractive towns in Carmarthenshire, a picturebook market town high above the river Towy with a lovely array of independent shops, delis, cafes, art galleries, colourfully-painted houses and a air of romanticism about it. We recommend a refreshment stop at GinHaus Deli or The Hangout and a wander around the little streets and back alleys. To end the day, take a wander with ancient trees, browsing deer and living history at the National Trust’s Dinefwr Park, just on the outskirts of Llandeilo, where the castle affords panoramic views back over to Paxton’s Tower, & the Towy & Gwili valleys, before following the A40 through the wide and fertile Towy Valley as the sun sets, home to Bronhaul. Thanks for reading! We hope this helps with planning your adventures on your next holiday to Carmarthenshire! Has this inspired you to come and visit? Get in touch to book one of our self-catering farm cottages or bell tents. Look out for the next instalment of our Locals’ Days Out series, where we’ll be taking you on a journey into myth & legend & some of the most dramatic waterfalls in Wales…. Angie is our resident artist & interior designer, and owner of Bronhaul Farm. She is the scurrying force of nature that makes Bronhaul the beautiful, green & tranquil place that it is. Each cottage bears the unique touch of her creativity and style, the gardens flourish under her careful touch & her farmhouse breakfasts and Victoria sponge are legendary! PreviousPrevious post:Baby Lambs, Snowdrops & Seeds – Spring on the FarmNextNext post:What Does It Mean to ‘Grow with Nature’?